To Redesign or Not to Redesign – I Need Your Help! I’ve been thinking for a long time about redesigning my site, but I keep going back and forth on it. My current design is actually a random design that I got as a freebie from a now-defunct designer when I first started my blog. I thought it was pretty, so I picked it. That was about all the thought that went into it. 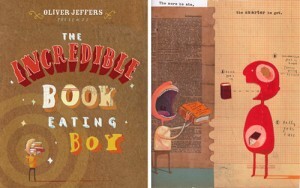 There are lots of other fun illustrations in this book that inspired me too! Obviously, I don’t want to copy this, but I love the idea of a girl with a wide-open mouth, ready to munch on a book! I’ve been thinking that maybe I could somehow keep a bird in the header too (maybe even a version of this same bird if I could manage it?) and keep the same general color scheme to keep cohesiveness, but I’m not sure. Would it be better to just do a total overhaul? BUT (there’s always a but, right), there are a few things holding me back from making any changes. First off, I get TONS of compliments on my blog design. Lots of people seem to really love it, and it’s distinctive. Anyone who knows of my blog, even a little bit, recognizes the logo. Secondly, if I did decide to go ahead with the redesign, where do I find someone to illustrate this book eating girl for me? It’s not just an easy to find little vector that I can pick up anywhere – it would probably have to be custom. So, what do you guys think? 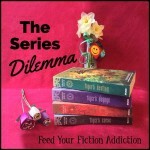 Should I do it or would you be sad to see my Fiction Addiction birdie go away? Does anyone have any recommendations for designers or illustrators? I want to know! So, please, take my poll! I want your opinions here because, as usual, I’m totally stuck! I love the design of your site! But I get it when you just want something different. I am indecisive myself so I am not help lol. Glad I’m not the only indecisive one! First, let me suggest http://99designs.com for your logo design. I’ve heard great things about this site and Joanna Penn loves it too, and I trust her, so I feel good about recommending it. Once you have a new header, maybe just tweak your current design to match it. New colors? Maybe some new fonts. I would leave all the functionality the same. Your commenting system is great. I’m a big fan (I know Lola uses the same) and I think your sidebar is fine without being too cluttered as well. This probably isn’t helpful, but I love the design of your blog. I think the header is really pretty and memorable. But, I’m sure that a new design would look great too. That is helpful – one of the things I’m trying to take into account is that lots of people really love my current design, so I want to know if that’s your opinion! Ooh yes choosing whether or not to get a redesign is a very hard choice. I’ve voted on the poll so hopefully it helps, Nicole! Thanks for your input! It’s really interesting to see how the poll is panning out! That’s kind of what I’m thinking. I’m even thinking of trying to incorporate the birdie into my new design in some way as a nod to the old design. I would love to see a new header — maybe in a similar style and even incorporating your cute bird, but having something to do with your theme. I like your blog colors and fonts but you might want to freshen those up at the same time. I wish I could recommend the designer who did my blog (Stephanie from New Chapter Designs) but she’s stopped taking on new projects. I was also looking at Stay Bookish (http://staybookish.net/design-shop/portfolio/) before I made that choice. She’s not doing full designs, only page elements so that might work if you just want a header. Whatever you decide, I hope to see something new soon! I LOVE your design (and other designs that your designer has done). I would definitely use her if I could!!! It sounds like a custom design, definitely. Parajunkee and NoseGraze do great designs but I don’t know about pricing, I haven’t looked into it in detail. I do like your header as it is though, but I definitely understand the need to have something more fitting or fresh. I definitely am considering Nose Graze. I’ll have to look into Parajunkee too! I’ve been debating on redesigning my site for so long – probably the same amount of time as you. My problem is that even though I’m using a free Blogger design and could definitely stand to upgrade, I do feel like it looks like my blog now. So I’d have to do a whole and thorough re-design, and there are so many designers I like that I can’t decide where I want to go next. I also think I need to spend money, but I’m afraid of how much. Still, I think I’m ready to take the plunge and make a change. As I said last week, I like your blog design. The thing that keeps it in my mind besides the great title is the color palette, so I’d keep that. Personally, I’d start with a header and see what you think from there. A lot of “re-design” you can do yourself with a different theme or rearranging the sidebar. If I had 1 criticism I’d say the header was too tall, but I think that about all the WP blogs. That’s why I haven’t had a header made yet. I’m trying to learn the code to make the header shorter. Actually, yes, the height of the header is one thing that makes me want to change it. I’ve actually had to modify it quite a bit from the original – it was made for a much lower resolution screen and it originally had three columns. I had to do quite a bit of tweaking to get it to look the way I wanted it to. Then when I moved the WordPress, it looked even bigger, so I stretched it as much as I could without making it look weird. I think that’s the point where I really starting thinking I needed to switch things up. Okay, so, I DO love your current design, because it has that rare combination of fun, bright, AND clean looking that is honestly SO hard to find (I am hoping my new design will achieve that, keep your fingers crossed for me 😉 ). BUT, I do agree that finding something that maybe fits the title a bit more would be good too! Plus, who doesn’t love a change? It seems like everyone and their mom is doing a spring blog revival, so why not? I am usually insanely indecisive, but I LOVE new looks. Here’s my bottom line answer: change it up, but keep the whimsy, the fun, the personality. I think people like your design so much because it is so inviting, so keep that in mind, but otherwise, have fun with it! Paij Slater recently posted: ONLY TWO DAYS LEFT TO ENTER!!! I’ve been thinking about a new design too, but can’t make up my mind either. While something new & different would be fun, I still love my current header. 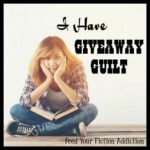 I really like your header as it’s fun and creative, but like the idea of a girl eating a book to tie in with your blog name. Sorry but I’m as indecisive as you are! I got a newer design not too long ago. Nothing too crazy, but I think it’s cute and fits the theme of my blog name a bit better. For you though, I’d say work on the header and go from there. I DO like your blog design but I understand wanting to change things a bit. I have been thinking about design for my site, too. Mostly I am just reconsidering the logo. I use my logo as a template for a ton of graphics so changing my logo would mean changing a bunch of graphics, at the very least for future posts. Ugh! It would be very time consuming for me. I hope you do what ever makes YOU happy with your site. It is nice that you ask out opinion, but your opinion is the only one that matters here. Haha I kept on tweaking my blog design for a while until I was happy with it. I’m a big DIY person so I was limited to what I could come up with on my own. I think it would be fun to try out a new header, but I like the rest of your design so I wouldn’t change too much! I’ve found that just by tweaking the colors on my blog a bit (black to gray) and switching up the info in the sidebar can make a world of difference. Do you have an connections to a graphic designer? Maybe via LinkedIn or FB. A friend who might be willing to design your logo and you go from there. I like the design of your site but I do understand the need for change. I say if you feel you need to then do it! I’m sure whatever you come up with will be just a good if not better. 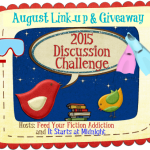 Mishma @ Chasing Faerytales recently posted: A new look,some announcements and a giveaway! I think this is a hard decision, but I think you have to make it. I like your current design, but I also wouldn’t mind if you got a new design. It might take some getting used to, but eventually people will recognize your new design as well. I like to change small things in my design now and then. I also use the Tweak Me theme, but I recently got a new header, although it still includes the pony it is still a little different. I would recomend checking out Michelle from My Limabean Designs (http://www.becausereading.com/my-limabean-designs/), she design with a cute and cartoonish style. She designed most of the banners for my blog and my features except for my pony. 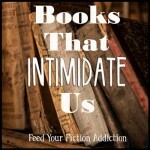 I do like your idea of featurign a girl eating books and how that would display your blog title. If you like the tweak me theme I don’t think you need a full redesign, unless you really want that ofcourse. Good luck with deciding! I think if you’re still pondering this a month later you need to wait until autumn and think about it then. It’s working fine the way it is. Relax and enjoy the summer. I’m thinking of redesigning mine right now too. I say go for it! It’s always fun to do something different!! I voted NOOOOOOOOO!!! I love your design! But… I can perfectly understand that you want to change it! I change mine every week! I still haven’t found 100% what I want. When I started my blog, I explored the internet for images I liked and used them as header, icons, etc. with permission of the artists. None of them asked me to pay 🙂 Maybe you can try that first before committing. Personally I love the way it looks. It has a very calm, relaxing feel, while still being colorful and fun. I have been debating myself whether I should change my own blog. While a fresher look is neat, there are elements I would hate to lose plus I am not a tech or graphics person and I cannot afford one either. Anyways, if you want a change then change it. But if you like what you have, keep it. you are the one who spends the most time here. You should love what you look at.